Sam Wakerley is Head of Insurance for HFW in the Middle East. He has been based in the Dubai office since 2005 and handles a wide range of disputes work with a particular specialisation in insurance and reinsurance claims. He has advised on some of the region's largest energy, marine, property, liability, construction and PI insurance/reinsurance claims. Sam also advises on shareholder, JV and other commercial disputes. His work involves general advisory work, supervising local court litigation, DIFC court work, English High Court work, arbitration and mediation. 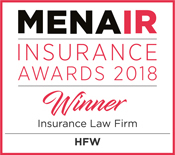 Sam is consistently recommended in both Legal 500, Chambers and Partners, and in the International Who's Who of Insurance and Reinsurance Lawyers. In Chambers Global 2017 Sam Wakerley is described by clients as "clear, concise and very tactical; he can see the bigger picture without omitting the details."